One of my favorite spots to eat in DC is one that is a little off the beaten path in terms of where you’d expect to find great food. 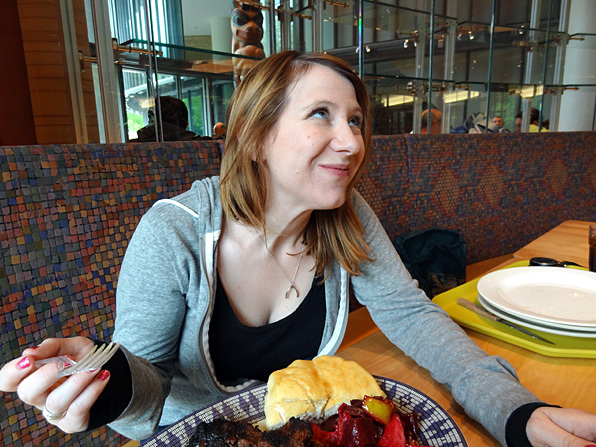 What I am talking about is the Native American Museum; their food is authentically delicious! Growing up, I wasn’t one of those kids that spent summers and weekends museum-hopping, despite living less than a hour from our nation’s capital. This absolutely astonished my husband, and as a result, our third date was to the Natural History Museum in Washington, DC. Once married, it was a mission of ours to spend more time visiting the plethora of museums DC offers. That’s when I fell in love with cuisine from this museum. I was boasting about the food from this museum to my ‘sister’ and she became so intrigued that she insisted on a quick trip to DC to check it out. The cafeteria to the museum is set up by region and each region displays tons of mouthwatering dishes. It was hard to choose which dish to select. Kelly and I decided to split their Five Region Sampler. 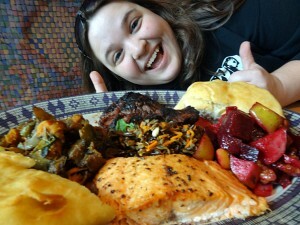 It had smoked salmon, blackberry grilled bison, sweet potato hash, wild rice and a beet and pear salad. 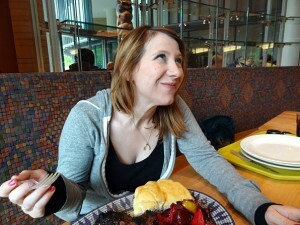 We also could not pass off their fry bread – who could? The smoked salmon was absolutely incredible. Perfectly season and cooked, it was juicy and flavorful. The perfect bite was paring it with a little wild rice. The wild rice contained pecans, giving it a nutty flavor, and golden raisins for sweetness. The blackberry grilled bison was cooked to a beautiful medium rare. The blackberry glaze helped cut the gamey flavor of the meat. Neither Kelly nor I had ever tried bison before, but we loved it. One of our favorite components of the sampler was the sweet potato hash. It had just a little bit of spice that made the dish different from any other hash we had ever had. CookingShorts would really love to have that recipe because it would be a perfect Thanksgiving addition to our spread. The beet and pear salad made a not-too-sweet ending to our meal. We loved how the Native Americans used the earthy flavors of the beet to play off the sweet profile of the pear. The tang from the sour cream pulled everything together wonderfully. Of course we can’t forget the fry bread. We used it with the bison to make a little sandwich. The bread was light and crispy. We watched them make it fresh, tossing small dough balls into a pot of hot oil. Instantly the dough puffs and browns. Yum! Spending the afternoon indulging ourselves with incredible food in DC with my little ‘sister’ has become a favorite memory of mine. We had an awesome day laughing and acting like kids again. Thanks to the Native American Museum for doing what no other museum has done - make history edible. So the next time you’re on the National Mall and looking for some delicious, authentic food, give The Native American Museum a try. Great posting! I was looking for inspiration to celebrate and highlight indigenous peoples day on monday when I stumbled upon this article. When in DC, i’m definitely going to stop in at the museum and check out the restaurant. Thanks!